NK has a long and productive history of involvement in international activities. ClassNK is a member of the International Association of Classification Societies (abbr. IACS) since the Association was established in 1968. IACS is an international classification societies association whose major goal is to promote ship safety and prevent pollution of the marine environment by creating standards in cooperation with the International Maritime Organization (IMO) and other international maritime organizations. ClassNK assumed the chairmanship of IACS for the fourth time over the course of one year from July 2010 to the end of June 2011, making major contributions to the realization of the goals of the Association. The International Maritime Organization, commonly referred to as the IMO, is one of the sub-organs of the United Nations. The IMO, which is comprised of the representatives of the governments of each member country, is responsible for all global maritime affairs. One of the main functions of the IMO is the examination of matters related to ship safety and protection of the marine environment, the results of which are published in the form of international conventions or associated resolutions. These, in turn, are implemented by each member government by means of their respective legislation. IACS has observer status at the IMO and as such, participates in meetings of the Assembly, Council, Committees, such as the Marine Safety Committee (MSC) and Marine Environment Protection Committee (MEPC), as well as a number of Sub-Committees. ClassNK is actively engaged in the activities of the IMO through its dispatching of specialists to these various meetings as members of the IACS and the Japanese government delegation. ClassNK has established committees in various regions of the world with the aim of exchanging views between the Society and members of the shipping and shipbuilding industries in each respective region on a wide range of issues of mutual concern. 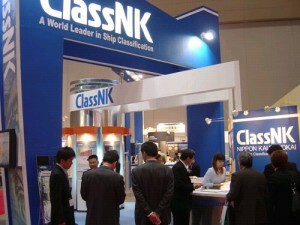 ClassNK is an active participant at many international maritime exhibitions, including Posidonia, Nor-Shipping, and Sea Japan, amongst others around the world. The Society has also sponsored as well as contributed speakers to numerous international conferences covering a broad range of topics of concern to many interested parties.